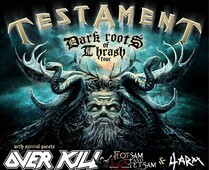 Thrash metal titans Testament have announced a headlining U.S. tour in support of their new album “Dark Roots of Earth” with Overkill, Flotsam and Jetsam, and 4Arm as direct support. The tour will run from January to February 2013. Continue Reading the Article at Examiner.com from Review Fix Contributor Chris Butera. Chris Butera has been absorbed in Heavy Metal since he was 15 years old. He has been playing in bands since 2006 and has interned for extreme music label Earache Records, while writing for Reviewfix.com since its inception and more recently for Examiner.com. When he isn’t doing anything music related he’s probably reading comics or classic books, watching a horror movie or a wrestling match, or pretending to be a dinosaur.